Last month our survey asked what types of hives you have. Ninety-three people participated in the survey. Most of the people who responded use traditional Langstroth hives with some combination of deep, medium, and shallow boxes. The most common configuration was one or more deep brood boxes with medium honey supers. In addition to the traditional Langstroth hives, people also reported using horizontal Langstroth hives, Warre hives, and top bar hives. Nineteen percent of us reported using multiple types of hives (includes using different configurations of traditional Langstroth hives). 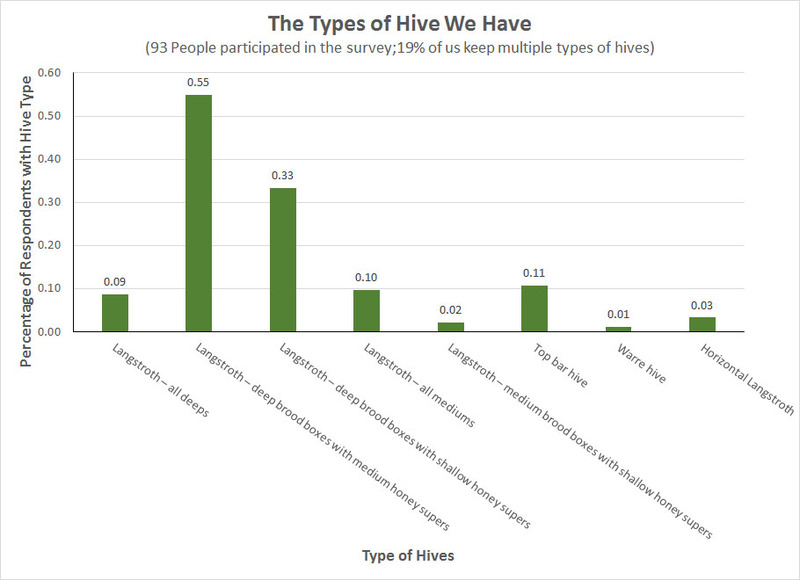 The graph below shows what percentage of us use each type of hive. Thank you to all who participated in the survey.